This year is National Pathology Year, and the organisers have allocated each month with a theme. April’s theme is Parasites and Pathogens, and so to keep with this theme I have decided to talk about lymph nodes because they play a major role in our defence mechanisms against microorganisms such as bacteria, viruses and parasites. The Lymphatic System. Primary lymphoid organ = blue. Secondary lymphoid organs = pink. Lymph nodes are part of the immune system known as the lymphatics, serving to distinguish between cells that should be inside us (self), and those that shouldn’t (non-self). Similar to our blood system, the lymphatics consist of a network of lymphatic vessels that interconnect lymphoid organs such as tonsils, thymus gland, spleen and lymph nodes (see opposite). Flowing through these vessels is a pale bodily fluid called lymph. Its contents are very similar to blood, except the red blood cells are absent. White blood cells, however, together with plasma-type fluid manage to filter through. The lymphoid organs that are involved in producing the body’s immune cells are known as primary lymphoid organs. These include the thymus and the bone marrow. These organs are the army base for the immune-cell soldiers to prepare for their attack. The tonsils, spleen and lymph nodes are secondary lymphoid organs and are home to where the actual immune responses are raised. A sort of battle-ground, if you will. There are a wide range of cells that are involved in creating an immune response. lymphocytes: those that identify the pathogens. phagocytotic accessory cells: those that aid disposal of the offending agents by engulfing (phagocytosis) and digesting them.. Lymph nodes can be found in several places all over the body, as shown in the image above as small dots along the lymphatic vessels. Normal lymph nodes are roughly oval in shape, a little firm to the touch, occur in a range of sizes up to about 2cm and are jam-packed full of lymphocytes. The dense looking patches of purple are thousands of tiny immune cells, the majority of which are lymphocytes. They are all encased within a capsule, in and out of which our lymph flows via lymphatic vessels – much like as if the lymphocytes were clustered inside a balloon, and lymph was poured in at the opening. Lymph firstly floods the sub-capsular sinus gap between the clusters of lymphocytes and the capsule wall, before filtering deeper inwards through the node. As lymph filters through, anything non-self that has hitched along for the ride is singled out and halted in its tracks, by the lymphocytes. At higher power, the mature lymphocytes can be seen as distinctly more rounded when compared to other cells. Also amongst them are phagocytic cells (dendritic cells and macrophages). Most of the other irregular looking cells are lymphoctyes at different stages of their cell life. How do lymphocytes recognise non-self? The cell surface on every cell in our body is peppered with all kinds of protrusions, ranging from simple cell surface markers, known as antigens, up to more intricate structures such as hormone receptors. Lymphocytes recognise non-self when they happen upon cell surface antigens that aren’t in their repository of known self-antigens. Foreign materials, such as pollen, also present with non-self antigens, as do cancer cells; both of which can cause an immune response. Pathogenic antigens can be found either parading freely around the body, e.g. on the surface of bacteria; or presented on the surface of any cell that has been invaded by the pathogen e.g. a virus-infected cell. Particular zones of the lymph node are home to particular subtypes of lymphocyte. The cortex of the lymph node is mostly populated by a subtype of lymphocyte known as B-cells, while the slightly deeper region that is sandwiched between the cortex and the medulla (known as the paracortex), contains mostly T-cell lymphocytes. B-cell lymphocytes recognise and respond to antigens that are free-flowing around the body. Once activated, they produce antibodies. T-cell lymphocytes recognise and respond to cell-bound antigens. One type assists B-cells in antibody production (helper T-cell). Another type, once bound to an infected/cancerous cell, will independently attack it to destroy it (cytotoxic T-cell). Looking at the photomicrographs above, stained with Haematoxylin and Eosin (H&E), it is difficult to distinguish between B and T-cells. In cases of cancer of the lymphocytes (lymphoma), it is crucial to know which lymphocytes have become malignant in order to administer the correct treatment. 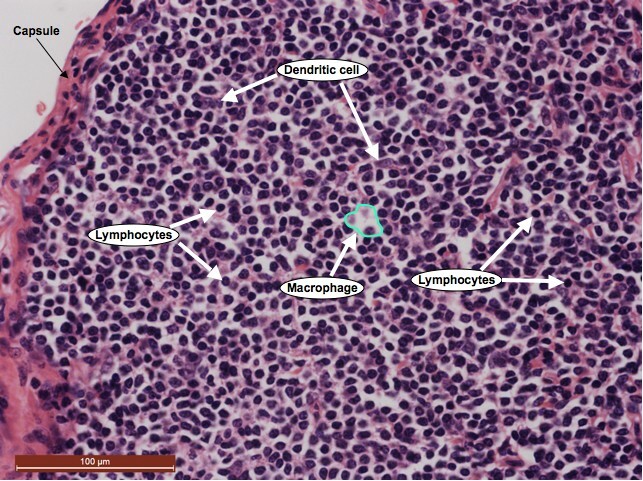 Labelling of the different lymphocytes can be carried out by a staining method called immunohistochemistry. This is a specialised technique that uses a brown dye attached to antibodies that specifically bind to the cell you are interested in. For example, B-cells contain a surface antigen known as CD20 (cluster of differentiation 20), but T-cells do not. By staining the tissue section with CD20, we only highlight the B-cells. Similarly, we know that T-cells contain CD3, whereas B-cells do not, and so by staining the section with just CD3, we only highlight the T-cells. Although B-cells are continually produced by the bone marrow, they leave their birthing place as immature cells. They complete their maturation in the secondary lymphoid organs, such as the lymph node. Once matured, they are ready for attack. Lymphocytes can become activated a number of ways. One example of lymphocyte activation that occurs in the lymph node now follows…. When a B-cell identifies a non-self surface antigen on a bacterium, for example, it binds to it via a specific surface antigen receptor to form a complex. The B-cell and non-self antigen complex continue their journey together through the blood and lymphatic systems. When the complex reaches the T-cell rich paracortex zone of the lymph node, helper T-cells also recognise the non-self antigen and instruct the B-cells to start multiplying and produce antibodies against the non-self antigen. The antibodies then attack the pathogen by binding to its surface antigens and preparing it for its removal by phagocytic cells (see slideshow, below). As the B-cells proliferate, the process is displayed by the gradual appearance of roughly circular “follicles”. The paler central zones are known as germinal centers. When B-cells multiply (proliferate), the appearance of the lymph node begins to change. Instead of the homogenous looking purple dots seen in the photomicrographs above, distinctly paler follicles develop in the cortex. The follicles are paler because the B-cells contained within them are increasing in size, making the paler contents of the cell (the cytoplasm) more prominent. This process is a common cause of enlarged lymph nodes in the neck, when we suffer from an infection. The function of this proliferation is to produce two types of B-cells; those that produce antibodies (plasma cells) and those that are simply an exact copy of the B-cell from which it originated. This helps explain why our immune system responds more quickly to a reintroduction of an infection we’ve already had. This happens because, before our B-cells have become activated, there were fewer B-cells around that have the specific receptors for the intruding antigen. After proliferation, we have thousands more; all of them armed with an arsenal of specific receptors for that specific pathogen, and all with the potential to produce the relevant antibodies to attack it, too. When the infection has cleared and the B-cells are no longer being activated to produce antibodies, the follicles – along with the lymph node itself – shrink in size, and the lymph node goes back to its original, homogenous appearance. Our lymph nodes are very important indicators of pathology. Any disease of the lymph nodes is usually referred to as lymphadenopathy. When we have a sore throat, we sometimes feel small lumps in our neck, and the GP will look out for them, too. This is usually a good indicator of an infection and may suggest we need some antibiotics. Grossly enlarged lymph nodes may require a more intrusive investigation as these may raise suspicions of lymphoma or other malignancies. Lymph nodes are also scrutinised during operations for the removal of previously diagnosed cancers, such as breast or malignant melanoma of the skin. Their role in these cases are to identify if the cancer has spread (metastasised). In some cases, small fragments of the cancer break away from the main tumour site and become lodged in the sub-capsular sinus. Finding lymph node metastasis aids the clinician to gauge the patient’s future treatments and outlook (prognosis). All images and footage are Copyright © 2012 Della Thomas, unless otherwise stated. Thanks so much for your comment, Danny. I hope your relative will be well again soon. Hopefully the websites I have linked to at the end of my post will help to answer some of your questions. yes they helped me much, I also find a lot more info in other sites too, now i’m finally starting to understand deeper what is lymph system. Thanks again for your article! Thank you for your compliment. I’m so pleased you were able to find the information you sought.